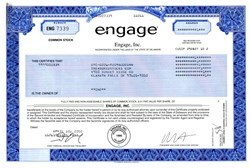 Beautifully engraved certificate from Engage, Inc. issued in 2002. This historic document was printed by the Jeffries Banknote Company and has an ornate border around it. This item has the printed signatures of the Company’s President and Chief Executive Officer, and Chief Financial Officer and Treasurer, and is over 9 years old. Engage Inc. made software for online advertisers and was based in Andover, Mass. Engage was majority owned by CMGI Inc., an Internet venture company.